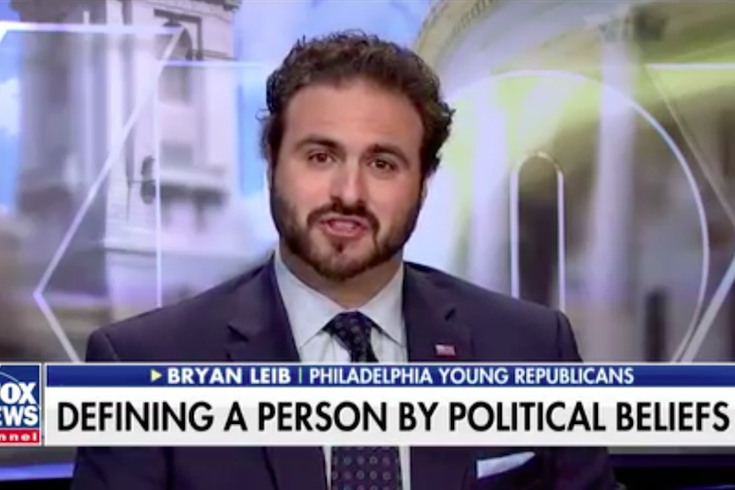 Bryan Leib, Philadelphia Young Republicans Treasurer, took his tale of how political leanings have impacted his dating life to Fox & Friends on Wednesday, November 8, 2017. Remember last November 8 when a guy who filed for bankruptcy protection over his Atlantic City casinos won the presidency? Yeah, I thought so. Good times for some, bad times for others. While some of those among us – including many who will likely comment on this very post! – are savoring the anniversary, some of those who voted for casino man are ruing the impact it's had on their lives. At least that’s how a story this week in the city’s broadsheet newspaper described the challenges facing folks like Bryan Leib, aka the treasurer of the Philadelphia Young Republicans. Then she asked for whom he had voted in the presidential election. Leib, treasurer of the Philadelphia Young Republicans, answered honestly: Donald Trump. Speed dating question: do you like donald trump? That predictable reaction stopped neither Leib nor his love-seeking heart from taking his tale of woe to the national stage on Wednesday morning with an appearance on the safe-space Fox & Friends morning program. Far be it from me to chime in on people’s pursuit of love. I found love before people began relying on swiping. If I were to say anything, it'd be this: It's a good (and not bad) thing when one person at that date table tries to delve deeper into the mindset of their potential lover. Is not the basic premise of a date to get to know the other person better, to gauge future prospects, after all? As he shares a split screen with that casino guy and his wife waving from an airplane loading platform, he further explains. The discussion then turns to days of old when unwritten rules held that off-limits dating topics included politics, per co-host Ainsley Earhardt. Leib, who doesn't exactly hide his political leanings on social media, looks on the bright side of that cultural shift. "(Talking about politics on first dates) could be good for engagement," he said, referring not to marriage proposals but "especially for voter-turnout purposes" in cities like Philadelphia where turnout is subpar. “Anything that gets more Philadelphia millennials to vote, I’m all for,” he said selflessly. He was then asked whether the country would be as polarized had Hillary Clinton defeated Donald Trump in that election one year ago today. “It couldn’t be anything farther from the truth for me, and for probably 95 percent of Trump’s voters if not more,” he shared. "I take great offense to things like that." It wasn't all bad, though, as any attention is seemingly good attention. I caught up on the phone with Leib after the interview aired on Wednesday morning. Despite having to get out the door at 4:45 a.m. to get to Fox's local studios, he maintained a positive outlook on the situation. "There has been lot of positive reaction, people reaching out to me after they saw it, saying they liked the article and what I had to say," noted Leib, a former Democrat who worked to get Anthony Hardy Williams elected mayor in 2015 but did "some soul searching" that led him to the Republican flock. "There are a lot of negative people saying negative things, too, but overall, the reception's been great." He said he's dated since that bad experience and has had good times with people "who realize politics doesn't have to be front and center." Though he'll engage in political talk since it's his "bread and butter," he prefers to get to know companions on a "who are you, what do you like, how about the Sixers or Eagles" level. "People on the other side of the political spectrum don't even want to get past that," he said. "It's unfortunate." So, does he expect to hear from his XIX date now that the encounter has gone viral? "No," he responded. "Definitely not."